In Bowling Green they were able to start a business, which stayed open for 16 years. “My family is grateful to have come to this country after all that we have been through,” Sefika said. Sefika and her husband, Izet, opened their first restaurant “A Taste of Europe” in Bowling Green in 1999. They said they wanted to create a European restaurant that matched their culture by serving Mediterranean Food. 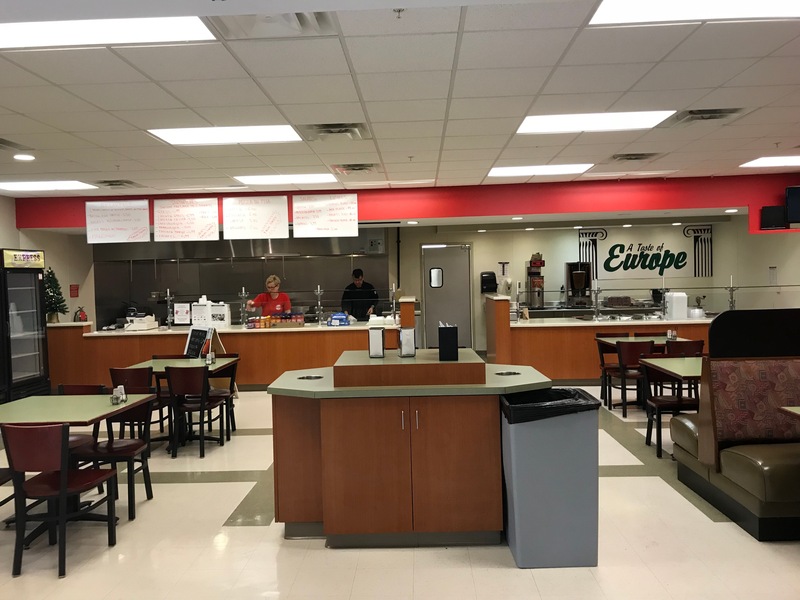 They started in the mall food court and then had a restaurant downtown on State Street for 16 years until last summer, when it moved to the South Campus of WKU. The move coincided with the university’s declaration of their home country, Bosnia and Herzegovina, as the focus of a year’s worth of cultural events. The Varajics left the country right before the start of the Bosnian War. Sefika, her husband, and their 2-year-old son left in 1992, a month before the war started, hopeful that the decision could save them from the mayhem that would soon occur. “I didn’t see anything bad yet, but I knew from what had happened in other places that we had to go,” she said. They fled to Germany, but Sefika said they weren’t happy there. According to the New York Times, millions of refugees fled Yugoslavia’s borders to escape the war , and Germany took the most refugees in the 1990s, 200,000 people. In Germany, Sefika and her husband Izet struggled to find jobs, couldn’t get citizenship and had to renew their papers every six months. “We had been there for six years with no good source of income, no citizenship. It was hard,” Varajic said. After six years, they decided to flee to the United States, a place where they believed they would truly be free. She said that she wanted a life and not to be stuck in a time of only despair. “I was so excited to move to the United States. I had a feeling it would be better than anything we had in Germany,” she said. The Varajic family arrived in Bowling Green in 1998, with an 8-year-old, speaking very little English and still without jobs. They attended a school at the refugee office for two months in Bowling Green to learn English and work on their language skills. Her son finally started school at Lost River Elementary School. Sefika and her husband both got jobs at a factory called Trinity Glass for $7 an hour. Sefika said they were more than grateful for their jobs. They both worked there for nine months before her husband decided he wanted to run a restaurant. Dzeldina Dzelil, niece of Sefika and Izet, said the factories were hard on them and it made them too tired to do anything with their son. “It was difficult for them to work at factories; it was hard to spend time with their child,” she said. Izet’s father had worked in a restaurant his whole life in Bosnia so he picked up some of his knowledge. Sefika and Izet talked about opening an restaurant and discussed why it would make sense to open one in Bowling Green. They found that there weren’t many restaurants in town but fast-food, and it definitely lacked a diverse type of food like European food. The only thing that was left to do was to find a place for their restuarant. Izet searched for a place for a while, and he found one. They opened “A Taste of Europe” three months later in 2000. At their Greenwood Mall location, they served Greek Mediterranean food. It was ran entirely by her family, her husband and his sister’s kids, including their niece Dzeldina. Sefika said people loved that the kids were working and it didn’t stop their flow of customers. She said it was a good experience for their first restaurant. But their exciting new restaurant came to a sorrowful end when the mall decided to remodel the food court in 2001. The Varajics received a letter in the mail six months later saying they could return, but they felt it was time to move on. They thought the rent for their location in the mall was too expensive, so they decided not to go back. “We found a place downtown and loved it because people immediately supported us,” Sefika said. Their second location was on State Street in downtown Bowling Green. The inside of the restaurant was made with mainly brick and walls with paintings of famous buildings on them. The tables were topped with white table cloth. Denise Houchir, a resident of Bowling Green and frequent customer, said that the Varajics take pride in their food, and you can taste it. The Varajics stayed at the downtown location for 16 years until someone bought the building. They had to find another place to serve their customers. They found an opening on the South Campus of WKU in August of 2017 — the same year that their home country of Bosnia and Herzegovina became the focus of the university’s International Year program. “I was so excited to move here. The customers who came to our downtown restaurant were great, but I love this location because I love being around kids,” Sefika said as she fiddled around with her fingers on the booth table. They stopped selling their larger menu of European food to focus on food aimed more for college students. Sefika said after serving real European food at a restaurant for a decade, they had to resort to fast-food type of meals for students like Gyros and French Fries. She said she doesn’t mind being on a campus because she gets a break when the students are on breaks. They aren’t getting the same business they had downtown and often have empty booths half of the day. Their busiest times are from 11 a.m. to 2 p.m., with still only a handful of customers coming and going. Sefika and Izeth get set for the day, getting drinks ready and turning on the fryer. Shawn Satazzan, an engineering student at WKU, said he eats there sometimes during the week and thinks they’ll become more popular once they’ve been there longer. “It’s fairly new, and it’s not that busy when I come there,” he said. Sefika said she is lucky and very grateful for the opportunities she has had here. Her family became citizens after five years of residing in Bowling Green. She said she has a good life right now but doesn’t plan on running a restaurant her whole life. She’s 50 years old and plans to retire when she is 60.